Rennie Kendrick, a soon-to-be graduate of Portland’s Grant High School, was the first to sign a “letter of intent” to attend the UO as one of this year’s Stamps Scholarship recipients. More than 100 people attended a signing ceremony at the high school Thursday, April 6. Kendrick was joined by the school’s principal, teachers, family, friends and the Duck as she was welcomed to the flock. Of course, there was cake — shaped like Hayward Field. Kendrick has written three cover stories for Grant Magazine at Grant High School, where she was the managing editor. In addition to participating on the award-winning Constitution Team, she ran on the cross-country and track teams and conducted experiments at Oregon Health & Science University in a behavioral neuroscience research lab. Her community service activities included working as a youth volunteer at the Oregon Humane Society and reading to children at the Hollywood Library summer program. 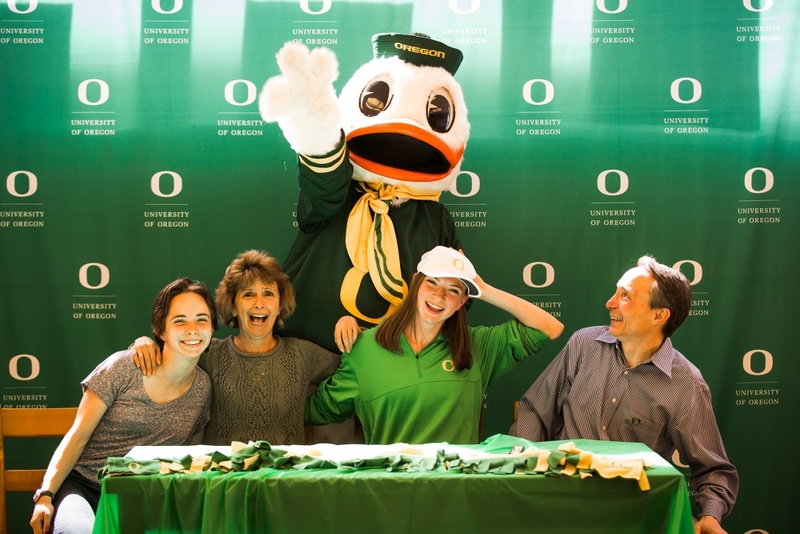 Stamps Scholarships are among the most prestigious and generous aid packages offered at the UO. They cover tuition, room and board for four years of undergraduate study and provide up to $12,000 in enrichment funds that help students pursue study abroad, internships and other experiences. They go to the most high-achieving Oregon high school students. Five Stamps Scholars enter the UO each fall. Additional signing events will take place this spring. Read their stories in a special Around the O section.